I feel that the most successful teaching must begin with a friendly and mutual respect between teacher and student. If a student does not trust their teacher, or does not feel comfortable in the lesson environment, learning is inhibited. Regardless of the student’s age and level, I strive to be encouraging and supportive, as well as demanding. Similarly, I want my students to know that their progress is important to me, that what they do matters, and that I also learn from them. In my instruction to piano students, I always try to explain (regardless of the specific issue--technique, musicality, interpretation, etc. ), not only what they should work on, but why it is important and how to fix the problem. My ultimate goal is to help them learn how to teach themselves. I feel a great responsibility to adequately prepare my students for the challenges and demands of the "real world," if they intend to make music their profession. I also teach many students for whom music is a hobby, and to see their enthusiasm and excitement after overcoming musical challenges renews my own musical energy. Regardless of age or level, I advocate a "well-rounded" piano education; thus, in addition to learning repertoire, I help my students to develop skills in sight-reading, playing by ear, transposing, score-reading, and improvising. I believe this is essential to becoming a complete musician. I also enjoy teaching in classroom and group situations. I like to involve the class as much as possible, by asking questions, having group discussions, or assigning class activities that require them to work together. I feel this creates a much more stimulating and interesting classroom dynamic, and promotes their learning from each other, as well as from me. 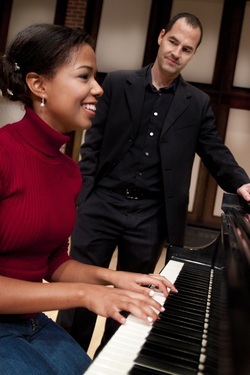 Although some classes, by their very nature, demand more traditional lecturing than others, I have found this to be a successful model in teaching courses such as Piano Literature, Piano Pedagogy, Class Piano, and Music History. No one goes into teaching to get rich. I teach because I love it, because I receive great satisfaction from sharing the knowledge and expertise I have acquired. Teaching also stimulates my own learning and my continued development as a musician. It is a pleasure to see my students grow and develop, as musicians and as human beings, and to prepare them for their own success in life.